This work was made for Joy Shoes, it is a series of works that were made by the artist for his friends. It is Acrylic on Stain Glass. 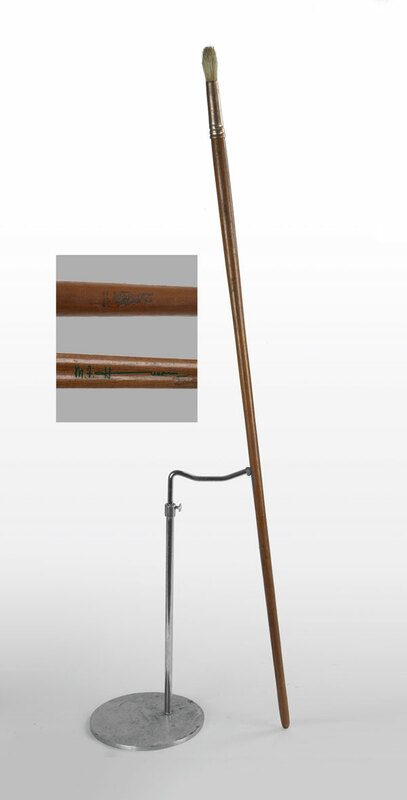 A tall painting brush made by M F Husain after he finished his movie Gaja Gamini. The brush has a signature imprint of the artist along with a logo of the movie imprinted above the signature. The brush comes without the stand. M F Husain was often seen walking with a tall brush like this one and it became a signature of his overall appearance. A silver coin made by M F Husain after he finished his movie Gaja Gamini, the coin has embossment on both sides, on one side there is a self portrait of the artist and on the other side is the logo of the movie Gaja Gamini with a back of a lady next to an elephant. 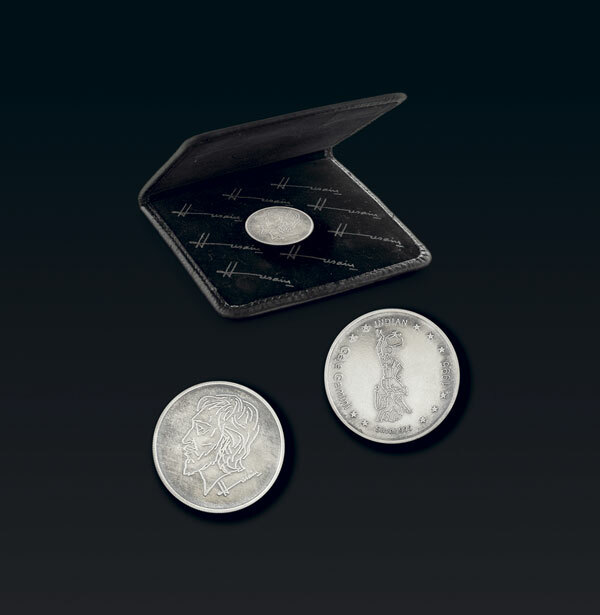 There is an embossment that says Gaja Gamini, silver 999, 1995, Indian along with the logo. The coin comes with a black case that has the same image on either side. Gaja Gamini logo carved in silver. It is placed on a black stand which M F Husain signed with a silver pen. This lot was made by the artist after he made the movie. 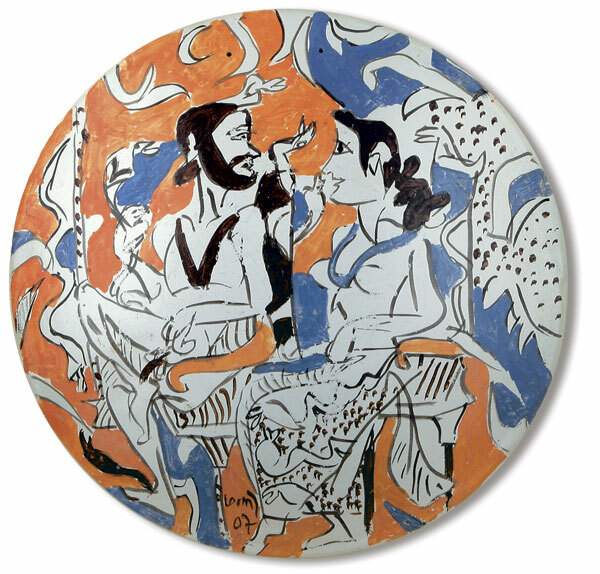 A hand painted ceramic plate by artist K G Subramanyan, the medium of this product is acrylic on ceramic. It is an image of a couple. 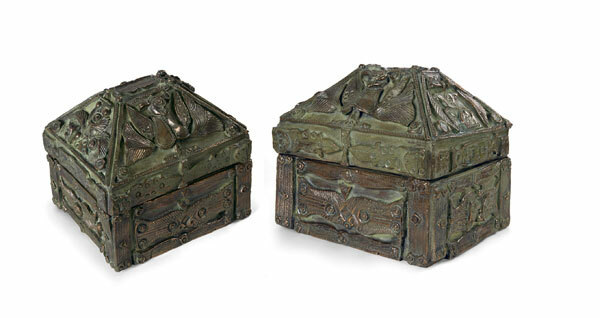 A beautiful bronze carved sculptural jewellery box by K.Laxma Gaud, the gross weight of this lot is approximately 15 kg. 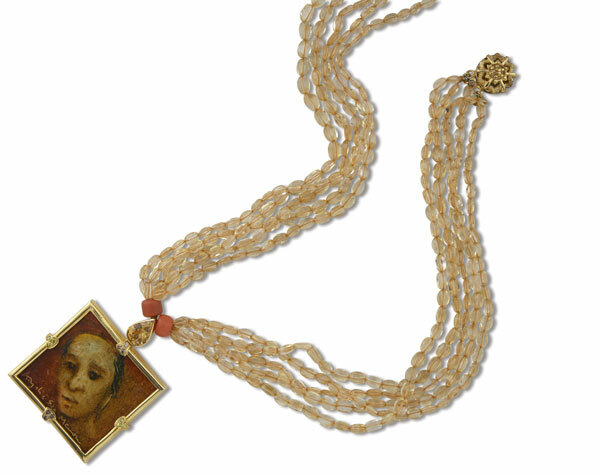 A multi-strand of faceted citrine beads and coral beads, joined with a gold filigree work, suspending a miniature portrait by the artist Anjolie Ela Menon (Oil on acrylic sheet, signed in English lower left and set in a frame of yellow sapphires mounted in 18 carat gold. A S H Raza pendant which is enamel work on silver of a bindu painting by S H Raza. 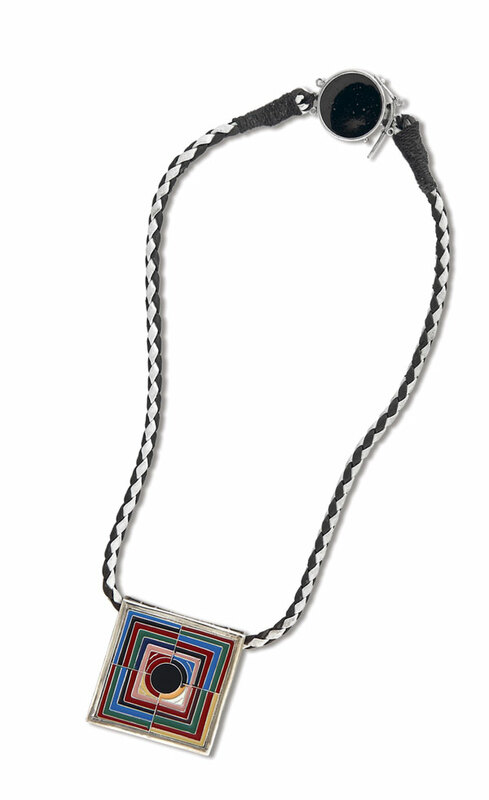 This pendant was made in association with the artist. 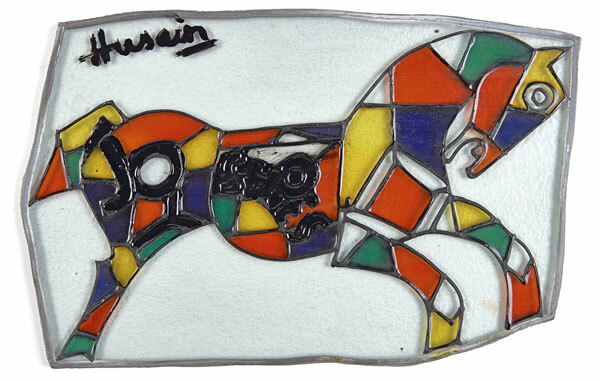 There is an engraved signature of Raza on the reverse of the pendant. 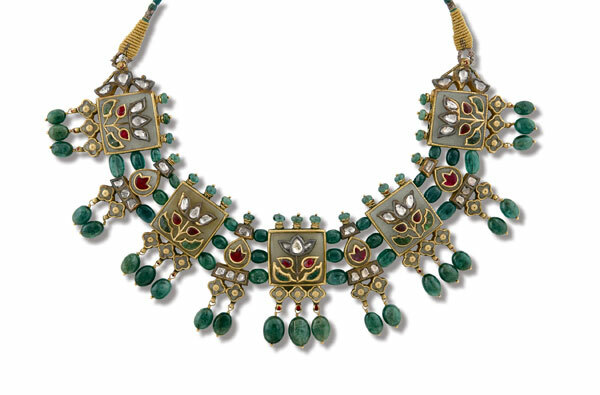 A multi-hauldi set of 9 pendants with jade, diamonds, rubies and emeralds. Each pendant is embedded with a floral design mounted in gold. The 5 square pendants have 3 hanging emerald beads each and the smaller pendants have 2 emeralds. Total gross weight of approximately 130 grams. This rare pair of enamel ear lobe plugs was worn by tribal royal families, it has blue and green meenakari detailing on it, weighing approximately 18.5 grams, length 3 cm. 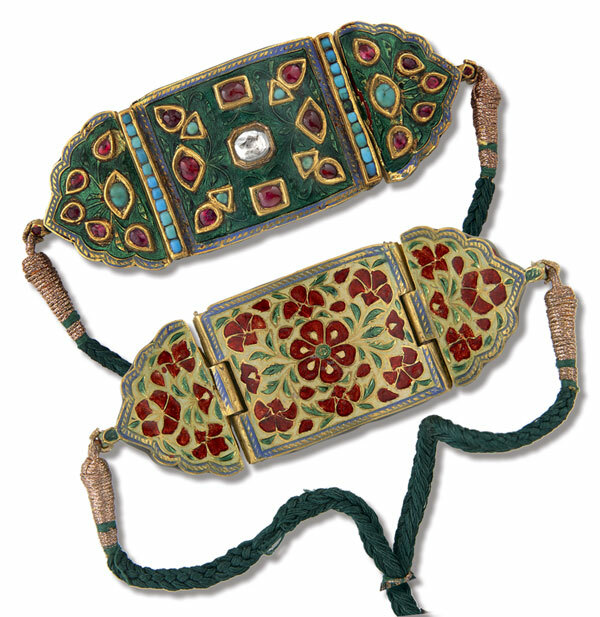 A ‘bazuband’ or arm ornament, which may be worn as a choker, designed as a row of three cluster plaques, in beautiful green enamel with multi colored gemstones, the reverse in a polychrome enamel in foliate pattern, joined by a silk cord, mounted in gold, approximately 52.115 grams, 8.0 cm. (length adjustable). 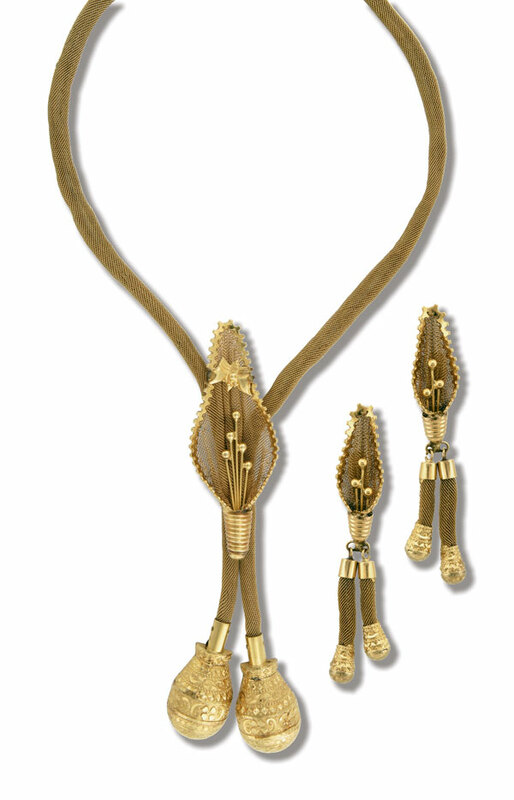 This lot is a beautiful hair accessory worn by women with a traditional Indian outfit. This hair accessory is generally worn on a hair bun. This is an extremely rare object. Total gross weight is approximately 21.2 grams. 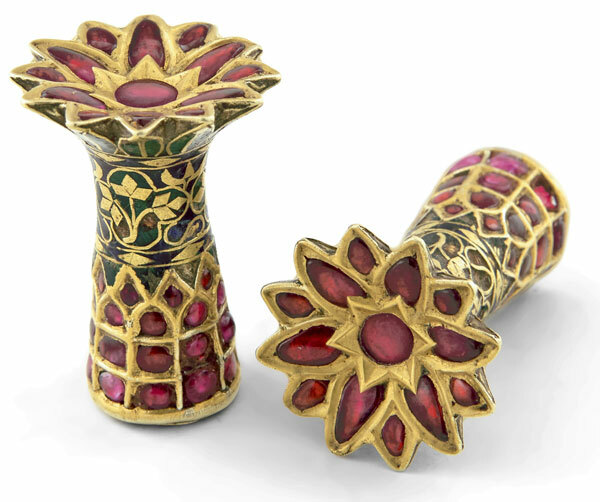 The piece is studded with Rubies and Polki setting with an impressive uncut diamond in the center. 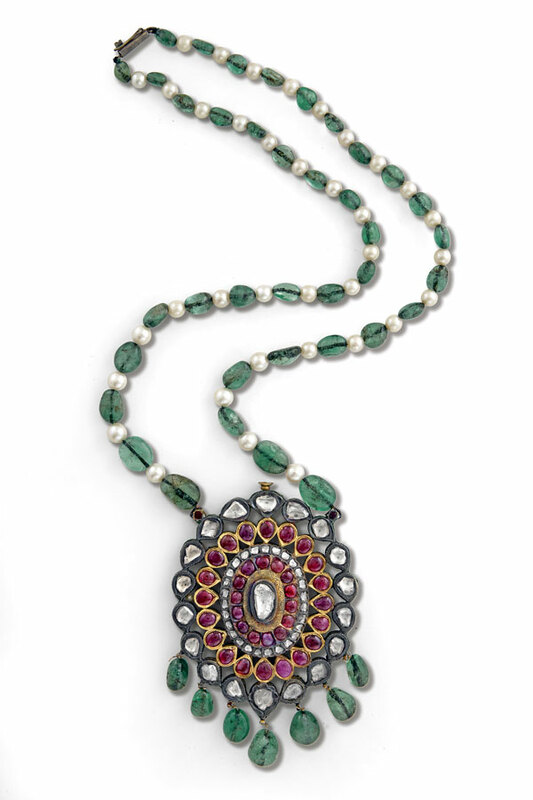 The piece consists of 47 uncut diamonds, 34 Rubies and 7 Emerald Bead tassels held together with an emerald and pearl necklace. 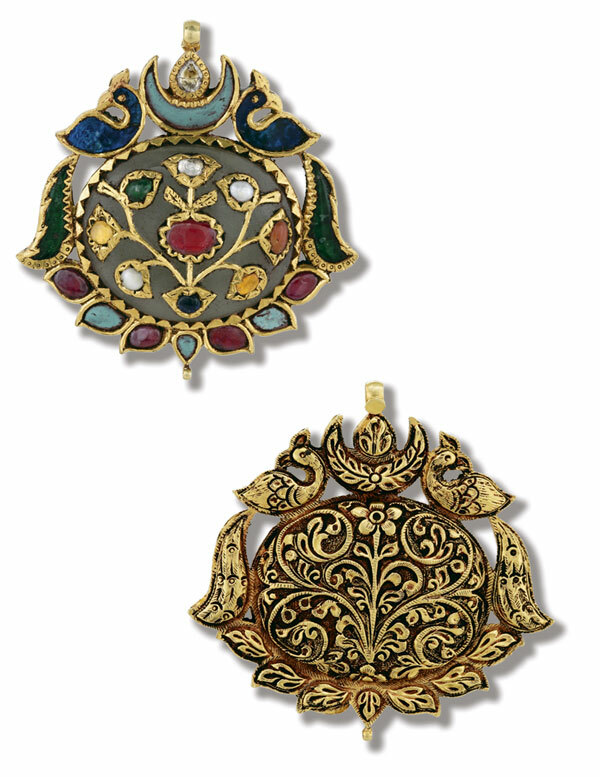 The pendant has a beautiful Meenakari on the reverse side and its total weight is 143.6 grams, length 60 cms. pendant height 10 cms. This early period gemset on jade laid in gold is considered lucky for several traditional Indian families. It is finely decorated in floral and peacock relief work on the reverse. Weight 33 grams and length 6 cm. 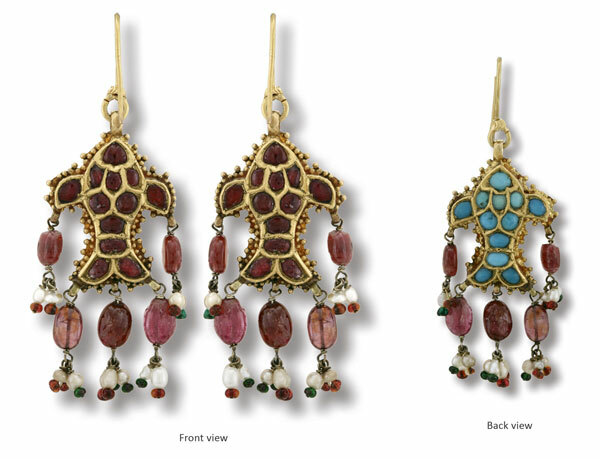 Each designed in the form of a stylised fish, with a total weight of 25.9 grams, suspended with hooks, with a fringe of pearl and ruby beads, mounted in gold, 7.0 cm. in length. 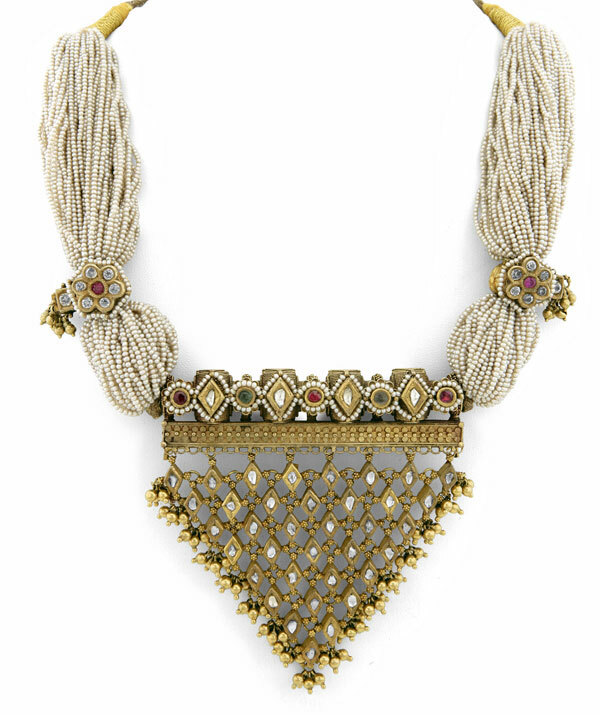 A multi-strand seed pearl necklace, with two links designed as stylized floral motif, suspended with triangle jaali pendant with fringes of ghungroo in 22 carat gold, detailed with small kundan and multicolored stones. Weighing 197 grams, with a length of 37 cm. Legend has it that the maker only made 2 of these in his lifetime after which he went blind. 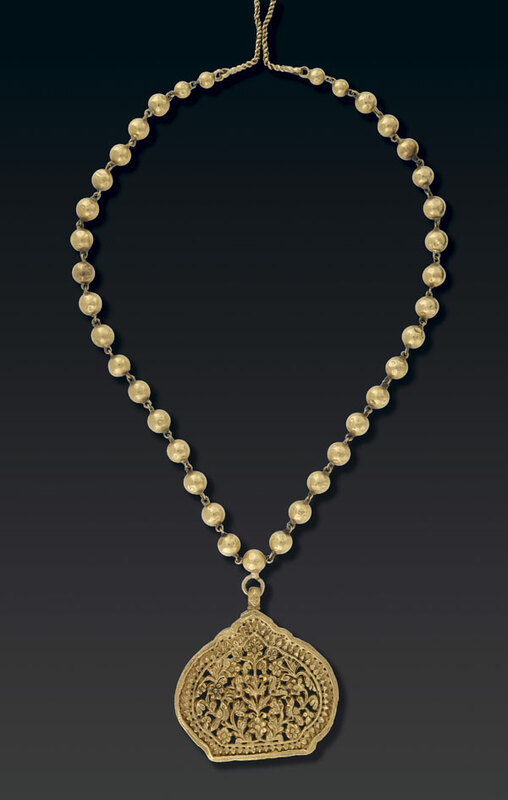 Made in the bolo-tie fashion, this intricate hand-made Jaali or sieve like necklace has large suspended gold drops that are held together with a stylized floral movable clasp, 9.0 cm, weighing approximately 93.6 grams in 22 carat gold. 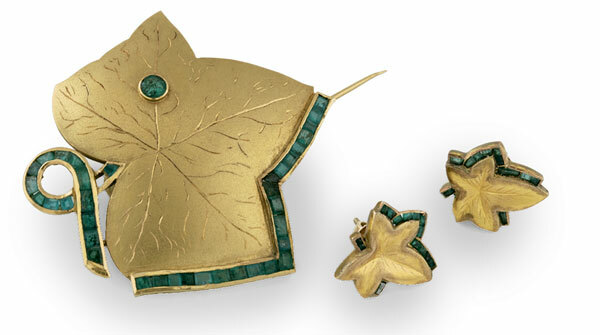 Comprising of a leaf shaped brooch, 5.0 cm., with a pair of similar ear clips, 2.0 cm., with green gemstones mounted in 22 carat gold, weighing approximately 23.660 grams. Designed as a flexible row of 9 flower shaped plaques with multicolored gemstones. 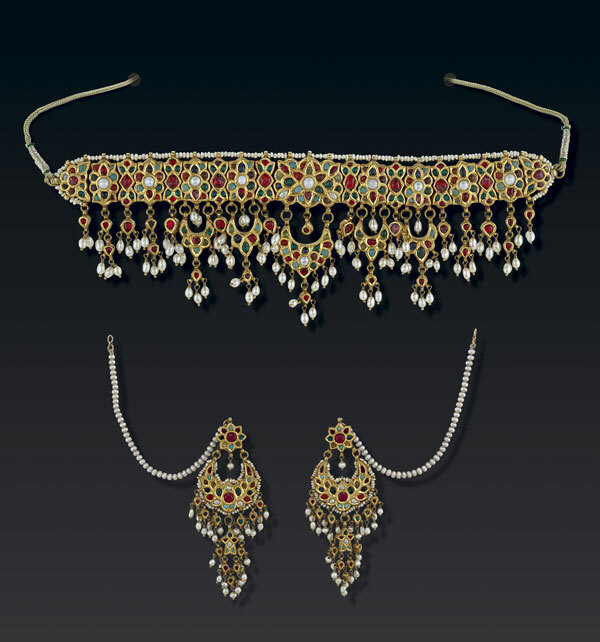 The choker has a delicate string of pearls which surrounds the upper edge and suspends a fringe of small pendants with multicolored gemstones and pearls, with a pair of earrings each designed as a stylized crescent moon, kundan-set with multicolored gemstones, surrounded by seed pearls, mounted in 22 carat gold. Total gross weight of 206 grams, with a earring length of 10.5 cm. This important Hauldi from the Lucknow tradition is designed as a strand of gold beads also called as ' matarmala', 64.0 cm. (length adjustable) joined by engraved gold finials to a pendant comprising of intricate filigree work in floral pattern, with a jade backing at the reverse of the pendant. 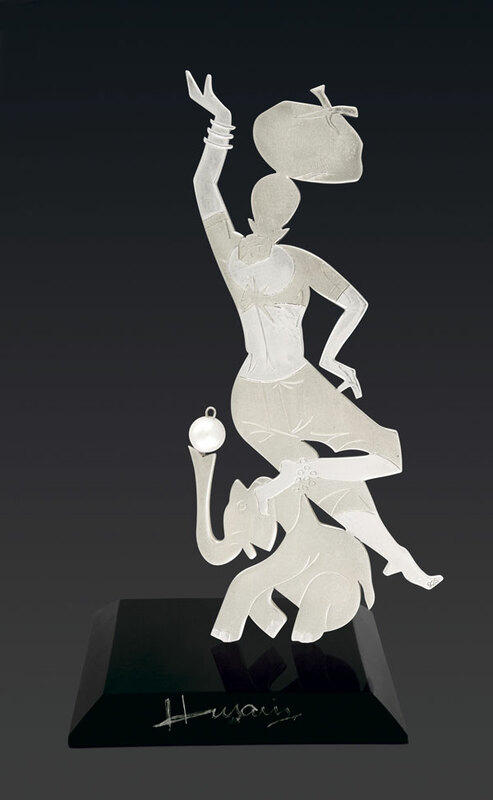 Gross weight of approximately 65.950 grams mounted in 22 carat gold, length of 64 cm. and pendant length 6 cm.